Sunday October 16th 1898 I was at home and busy most of the forenoon with the work. I read all the afternoon. Will went to River Junction for a man to work. It began to rain about dark. Monday October 17th 1898 It rained all night and was still raining this morning. Will had Charlie hitch to the buggy and take him to the depot to go to Delavan. Pink came in the forenoon. I was busy about the house most of the day. It was three years today since Charlie died. Tuesday October 18th 1898 Still gloomy. Ed Smith who came down to husk corn went back to town with Charlie Mc-- and I as we went up to the party at Mothers. When I got there found they were without help but we arranged to get the dinner ready in good time. It was very nice. It rained a good part of the day. Aunt Lib rode home with me, and Mary Briggs with Uncle George. 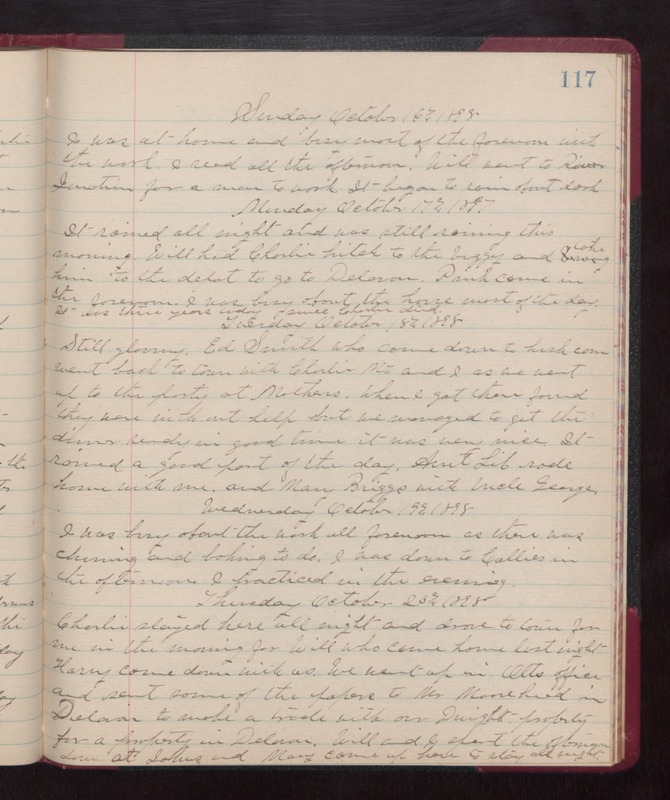 Wednesday October 19th 1898 I was busy about the work all forenoon as there was churning and baking to do. I was down to Callies in the afternoon. I practiced in the evening. Thursday October 20th 1898 Charlie stayed here all night, and drove to town for me in the morning for Will who came home last night. Harry came down with us. We went up in Otts office and sent some of the papers to Mr Moorehead in Delavan to make a trade with our Dwight property for a property in Delavan. Will and I spent the afternoon down at Johns and Mary came up here to stay all night.